October 3, 1968, the first instrument, developed and built at The Swedish Institute of Space Physics (Institutet för rymdfysik, IRF) was launched onboard the European satellite ESRO–1A. Fifty-one years later the first Swedish instrument landed at the Moon’s far side, as a part of the Chinese Chang’E-4 spacecraft. The first instrument, named S71B could measure charged particles in the magnetosphere. ESRO 1A was the first of many satellites financed by the European Space Research Organisation, the forerunner for today’s European Space Agency (ESA). The project paved the way for Swedish participation in the international space research community. Since 1968, the Swedish Institute of Space Physics has played an important role in several international satellite projects, in addition to managing their own national satellite projects. Participation in scientific satellites around the Earth open also opened the door for participation in building instruments to other planets around the Sun. This year marks the 50th anniversary since the building of the first instruments to another planet. The Aspera instrument at the Russian Phobos-1 satellite to Mars and its moon, Phobos. 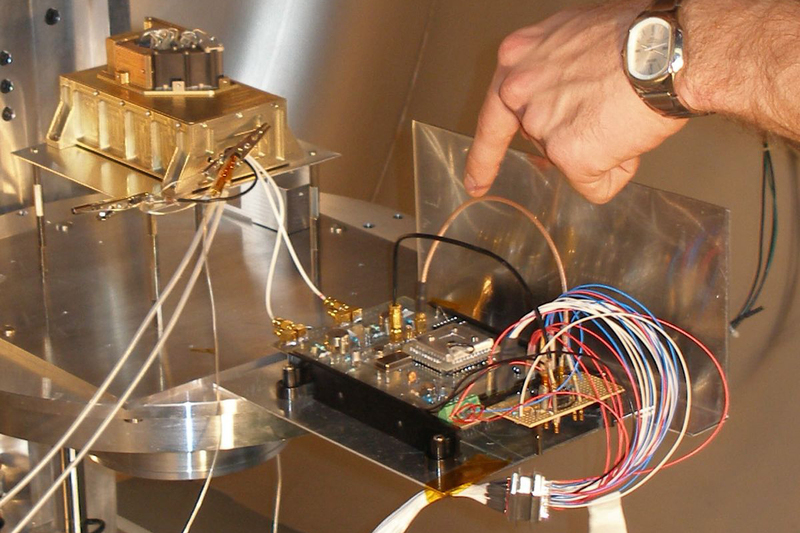 The instrument studies the interaction between space and the planet Mars. The Advanced Small Analyser for Neutrals (ASAN) ready for integration in the Chinese spacecraft Chang’E-4 spacecraft. Photo credit: Martin Wieser. Swedish Institute of Space Physics. The institute is not an ageing institute. The institute, originally established in 1957 as Kiruna Geophysical Observatory and only localised in Kiruna, now has divisions in Umeå, Uppsala and Lund, but the main office is still in Kiruna. The institute conducts research and postgraduate education in atmospheric physics, space physics and space technology. Measurements are made in the atmosphere, ionosphere, magnetosphere and around other planets with the help of ground-based equipment (including radar), stratospheric balloons and satellites. IRF is possibly the scientific institute in the world to have largest number of instruments in space. Today they have the ASPERA 3 with Mars, ASPERA 4 with Venus and the Ion Composition Analyzer at Rosetta, in orbit around the comet 67P7Churyumov-Gerasimenko. The dataflow from Venus and the comet has stopped, but the data is still being analysied and will provide new knowledge also in the years to come. The institute also continues to analyse data from their instrument at the Indian lunar probe Chanddrayaan to find out more about the solar wind’s effect on the Moon. Late in 2019, a Swedish instrument is set to land at another object in the solar system. Onboard the rower in the Chinese Chang’4 mission to the Moon’s backside, is one of the instruments, the Advanced Small Analyzer for Neutrals (ASAN). That is an energetic neutral atom analyser provided by IRF. It will reveal how solar wind interacts with the lunar surface and perhaps even the process behind the formation of lunar water. Today the institute is working on developing a new instrument for the European Juice mission to Jupiter onboard the BepiColombo mission to Mercury. IRF participates with the ENA instrument at the Japanese Mercury Magnetospheric Orbiter together MIPA onboard at ESA’s Mercury Planetary Orbiter. The instrument that was delivered from IRF in 2013, was launched these days and arrive s at Mercury in December 2025. Despite decades of space research, there are still many questions connected to the conditions in the near surroundings and the outer space, and IRF’s ambition is to contribute to achieving a better understanding of the basic phenomena. Many institutes, like the IRF, have advanced research programmes and develop instruments for use in space, but few participate in so many international projects as the IRF. Participating in Swedish, and other European projects almost goes without saying, but their professionality, and experience, allow the institute to participate in satellite project together with most of the international scientific community. 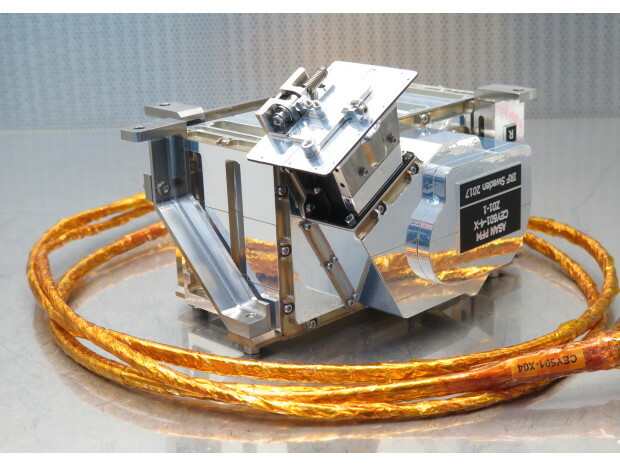 The IRF group in Uppsala is developing the Radio and Plasma Wave instrument for the European Solar Orbiter mission to the Sun, with launch scheduled for 2020, and in 2022 the institute will send two instrument packages to the planet Jupiter at the European JUICE mission. The instruments are the Particle Environment Package (PEP) from the Kiruna institute, while IRF Uppsala heads the development of the Radio and Plasma Wave (RPWI) instrument. Test of SWIM sensor. Photo: Swedish Institute of Space Physics. To be able to fully calibre and test instruments on Earth before launching to space, the institute has established an earth-based test laboratory to test instruments or parts of instruments, in near space conditions. The intention with the laboratory is to become the lead manufacturer in Europe in testing and calibrating of instruments developed for space missions. The laboratory, established with support from the community of Norrbotten is mainly a test laboratory for IRF, but is accessible for other institutes that need test instruments for very harsh environments. The laboratory can model most of the special conditions found in space e.g. different types of radiation, thermal conditions, mechanical loads, optical conditions etc. The centre can also test equipment for use in the atmosphere, not only around Earth, but also other planets’ atmosphere. Featured image: Illustration. Origin unknown. Solar Terrestrial and Atmospheric Research, Solar System Physics and Space Technology and Space Plasma Physics. Polar Atmospheric Research. Atmospheric research connected to the polar and near polar areas in both Arctic and the Antarctic regions. The data collected from measuring instruments that already exist in the region and the research is focussed on phenomena that are specific for the polar regions for example the effect of incoming high energy particles from space, the polar whirl in the stratosphere during the winter time and the polar mesopause during the summer. Solar Terrestrial Physic programmes study how our neighbourhood in space work and effects of variations at the Sun and the corona of the Sun has on Earth. Solar wind, ionized gas from the sun’s corona affects earth in many different ways. The most well- known is the Aurora Borealis, impressive to see, however, it disturbs communication during the most intensive periods. Despite decades of investigation, there are many mysteries connected to the phenomena and therefore the Solar Terrestrial Physic programme is a main pillar in the research activities at IRF. Solar System Physic and Space Technology mainly investigates how the solar wind interacts with the different celestial bodies in space. To investigate that the institute developed and built satellite instruments to measure the different planets or other celestial bodies. Through these programmes, the IRF has instruments around different planets.